On the evening of Friday 8th February, a small but happy group of us met up at the Leeds Grand to relax and indulge our inner child in front of the much-loved film, Beauty and the Beast…or so I thought! Joking aside, we were attending a screening of the original 1946 film, adapted from the original fairy tale – and directed by – Jean Cocteau. Lead actors included Jean Marais (the “Brad Pitt of his time”, we were reliably informed by Dr Claire Lozier of the University of Leeds’ French Department) and Josette Day. Dr Lozier gave a very informative and interesting background to the film, putting it in context against post-war austerity France. She highlighted the conditions of the time, remarking on such basic needs as white bed linen that wasn’t patched, or sourcing matching curtains – and how they were stolen from the set on one occasion. Once the film got underway, I had to admit that I agreed with her comments on the film: that despite these difficulties, the film didn’t look like it was made in a time when such basic things that we take for granted were in such short supply and such high demand. Claire also discussed how the special effects were “cutting-edge” for the time and I agreed with her about the effectiveness of the Beast’s fur, especially when combined with other quirky touches, such as moving heads in the supposedly solid stone busts and mantelpieces, the enchanted doors and the candelabra brackets which were human arms and lit up magically. The acting, of course, looked very dated compared with what we’re used to: as Claire outlined, there was something of the older, melodramatic theatre-acting style about it in places, such as the Beast roaming the castle corridors in a pained trance. So after an “apéro” in the theatre bar and the interesting talk by Dr Lozier, the lights dimmed…it was show time. The film itself was very well shot – okay, it may not be a match for modern hits like Les Misérables or the CGI wonders of Avatar or The Hobbit, but for its day, it was beautifully filmed and staged. Set in the 18th century, it tells the story of a girl, Belle, who must go to the Beast to die in her father’s place, after the Beast gives her father lodgings for the night when lost in the forest. He inadvertently forfeits Belle when he picks her a rose from the Beast’s garden. Belle’s family had fallen from grace when her father’s ships were lost as sea; while Belle is gentle and kind though, her sisters heap scorn on her and their father, and her brother is a layabout, yet they become jealous at the way she is treated by the ‘repulsive’ beast. At the risk of spoiling it for those who have not yet seen it, I have probably said too much already so shall stop here! On a cold but sunny afternoon in February, a motley collection of youth and experience filed into an underground bunker in the Parkinson Building at Leeds University for the Yorkshire Translators & Interpreters’ CPD session on CAT tools, ably led by Dr Dragos Ciobanu. Youth was supplied by many of the students from the Leeds MA course, while experience came from the varied careers of YTI members. Enthusiasm was supplied by all. After a brief personal intro from each of the 36 attendees, we then launched into an interactive and informal presentation on the pros and cons of various CAT tools, with a useful pricing comparison. Tea and coffee mid-way through saw a hubbub of conversation which could easily have taken up the rest of the day, had there not been more to come from Dragos. An anonymous student’s analysis of word counts, showing significant discrepancies between different CAT tools’ assessment of the total number words in the same document, proved to be the launching-point for the professional translators’ favourite subject: payment rates per word. A lively discussion ensued with pertinent questions from both students and professionals. Rounding off the presentation was a series of light-hearted awards for CAT tools in various categories, including “most colourful interface” which, to judge by the groans from the audience, was intended as an equivalent to the Razzie awards for the worst to come out of Hollywood. By the end of the session, the people I had spoken with thought it had worked really well, and could even have been longer: many of us were being herded out of the room while still deep in conversation. A successful and interesting afternoon. Can we have some more please? Held at Europa House in London, on Saturday 18th January 2013, this EU-workshop provided an excellent overview of the advantages and limitations of its public database IATE (Inter-Active Terminology for Europe). 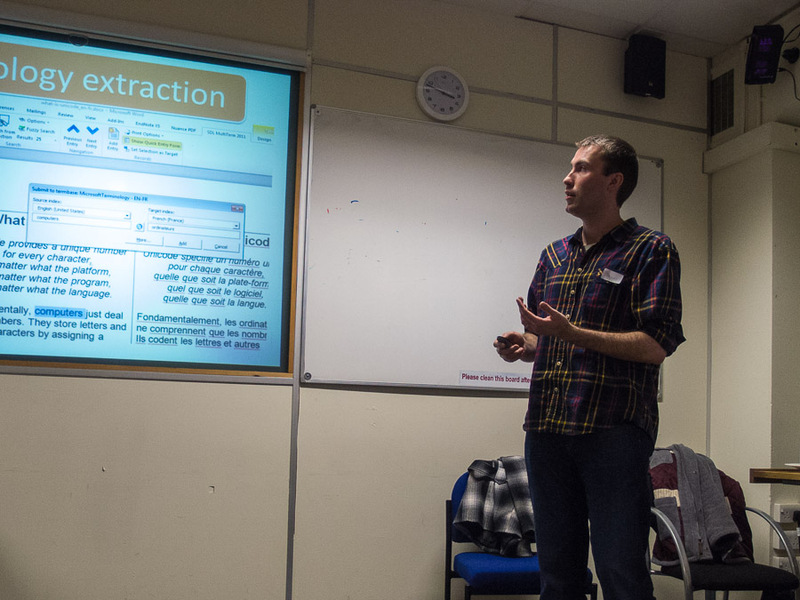 Given by EU in-house terminology expert Timothy Cooper, the workshop was in the form of a lecture to full house – the audience encompassed both novice and experienced translators, the majority of whom said they regularly used IATE. Explanations and examples were initially related to broad concepts prior to more focused references to the specialised translation undertaken by the EU bodies. Visuals, diagrams and powerpoint slides were used to demonstrate the key differences between lexicography and terminology. Subsequently, the lecture moved from this theoretical approach to a hands-on examination of the uses and pitfalls of IATE for the translator. Thus, the key differences between the in-house and publicly-available database were outlined, with slightly fewer entries at 1.3 million for the latter versus 1.5 million for the former. One key limitation identified in IATE was that of using domain names in searches due to the historical development and compilation of the database from a range of differing individual databases, linked to separate EU institutions. The ease of searching for IATE and related facilities via Google was also emphasized, such as for the EU Style Guide. Following the presentation, questions were taken from the audience and Tim Cooper provided clear and detailed answers. A few words were also given by other EU representatives, including on providing feedback on terms in IATE! The session lasted around an hour and a half, and participants all seemed to have enjoyed the time and more importantly, satisfied that they had learnt considerably from the experience. The same workshop is due to be held again later in the year, according to the EU Representation in the UK, for people who missed the event due to the snow. The event will be advertised via the ITI and regional networks. 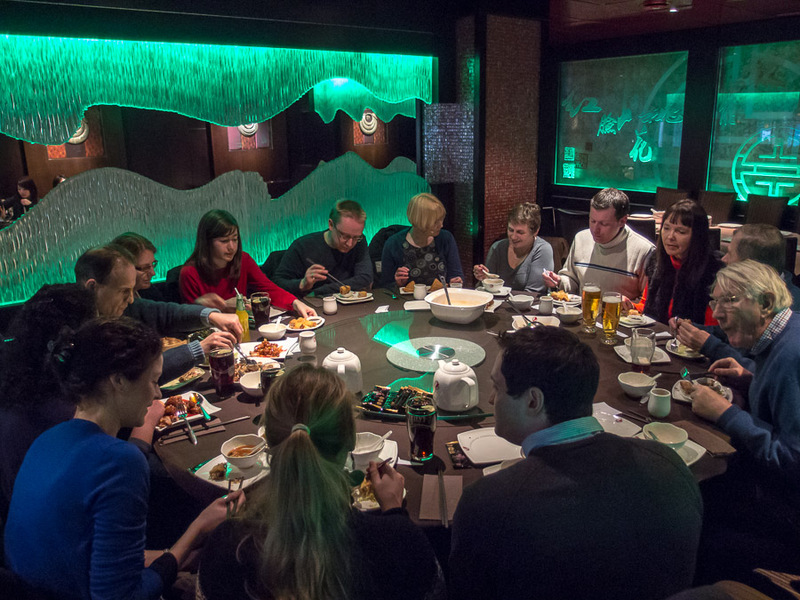 15 hardy Yorkshire folk braved freezing temperatures and lethally slippery pavements (not to mention “total signal failure” at Darlington) to attend the YTI post-Christmas lunch, held at the Red Chilli Chinese restaurant in the centre of York. It was my first visit to this particular establishment, and I was slightly taken aback by the sheer size of the dining area as well as the modern decor. After a brief period of chit-chat while lounging around in enormous armchairs by the foyer, we were shown to a giant round table that had just about enough circumference to fit us all around. It was actually the perfect type of table for a gathering of this size, as it meant that anyone could chat easily to anyone else without having to lever interlopers out of the way. I’m relatively new to the YTI, and I was glad to be able to make some new acquaintances. Everyone seemed quite satisfied with the food on offer, in terms of both quality and quantity. My main course (Gong Bao Chicken with chili) was so substantial that I briefly considered taking the remains home for a weekday lunch. As we all know, there is no finer freelancer lunch than three-day-old leftovers. However, the efficient service meant that my dish was cleared away without my even realising. Time fairly flew by in the convivial atmosphere, and before we knew it, most of the party had to take the short walk back to York station to get trains back to the furthest reaches of the county. The sight of the departures board reading “Delayed” for almost every train heading north or south from York was somewhat disconcerting, but I was going West, and the journey home was both on time and significantly less arduous than the journey to York that morning, when Northern Rail did not see fit to heat the balsa wood train that they insist on running up my line. So, all in all, a very enjoyable day and I’m already looking forward to the next YTI social event I can attend.